One of those things my family used to do(and are still doing) when visiting Johor or Batam in the past is for the sake of eating seafood there. The seafood which are not only much fresher than those that can be found in Singapore but would also usually cost only a fraction of what it would otherwise in Singapore. In the 90s, when crossing the causeway for seafood was still fairly uncommon, you could really go there and get seafood at the kind of price that is similar to what the locals there are getting. Now the restaurateurs at these nearby shores are getting smarter and will charge Singaporeans a tad higher than the locals but I must say that it is still considerably cheaper than what it would otherwise cost you in Singapore. Now other than being cheaper and fresher, seafood at these nearby shores also taste better. For me, their sambal chili always taste that bit more ‘pang’ and their goreng whatever(goreng sotong or prawns) can put me in awe of the wonderful smell like how KFC can. I don’t know about you but these were my personal experiences of eating Malaysians or Indonesians seafood. Their deliciousness just seem a notch higher than what we have here. Of course I’m not going to bring those hygiene issues into this discussion although I must admit that it all might just have some connection! Now if you look at the map of Jakarta, you would see that the north part of Jakarta is infact off the sea so it is really no rocket science that if you want to eat good seafood, then north of Jakarta is where you should head to, particularly the Pluit area. 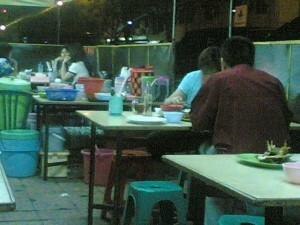 I was brought to this seafood place that looked more like a makeshift kopitiam with about 40 tables all lining side by side, all of it occupied with customers. Now that brought back sweet memories of what was the Long Beach restaurant at the corner of East Coast Road near to an army camp. In those days, that little corner had nothing but tables and chairs filling up acres of space and whenever I was there, the crowds were never missing. They even had the space 3-4 times bigger than that area just for cars to park. 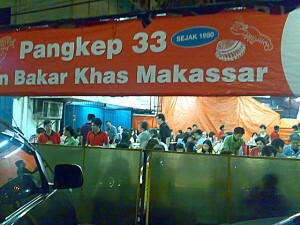 This little restaurant called Pangkep 33 at Pluit, Jakarta brought back memories that I thought were long buried dead. I left my partner to do the ordering and she miscellaneously ordered the usual stuff like Fried Kang Kong, Sambal Mussels, Goreng Sotong, Ikan Bakar(grilled fish) and Black Pepper Crab. The star of the night has to be split between the Goreng Sotong and the Sambal Mussels. The Goreng Sotong(It is called Cumi and not Sotong in Indonesia) had that fantastic goreng smell that is so typical to Indonesian or Malaysian kind of seafood but yet can never be found in Singapore! I loved that kind of goreng absolutely, I could imagine those gorengs making anything, the best dish in the world dosing in those salt and pepper kind of seasonings you can find in cantonese cuisines. The Sambal Mussels is simply the best mussels I’ve eaten in my life. It’s not so much about the sambal but those mussels were deep fried before they were tossed in those sambal sauces and for me that is something really really so simple to do but yet can escalate the taste of mussels to 10 times better! 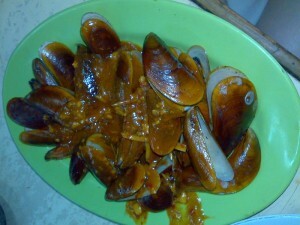 Thumbs up to whoever that came up with that style of cooking mussels! The rest of the dishes like Ikan Bakar, Kang Kong and Black Pepper Crab were equally good though not as outstanding as the Goreng Sotong and Sambal Mussels. 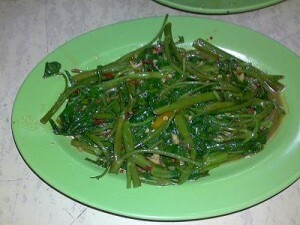 Now I must tell you that the total price of all these dishes are………*drumroll*…………Rp 120 000….which is lesser has SGD$20. I kid you not! OK after we left, it took me a while to realise that they actually forgot to add in the Pepper Crab as it was ordered separately, otherwise the bill should be something like Rp 180 000 to Rp 200 000 which should be around SGD$30+. Heck! That’s still a good price nonetheless! 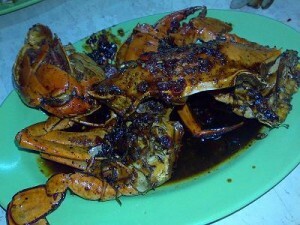 Where in Singapore you eat crab, sotong, fish, mussels for SGD$30? Not even in JB! Ok maybe in some ulu cze char place in some JB kampong you can find but definitely not this kind of quality you will get. Conclusion: Very authentic seafood place that wants to sell you nothing except good seafood at a very affordable price(super cheap price if you are Singaporean!). Dislikes: Absolutely nothing though the hygiene factors can be a bit of concern but since seafood comes from the seawater which is one of the dirtiest thing in the world, then really there isn’t much complain from me! 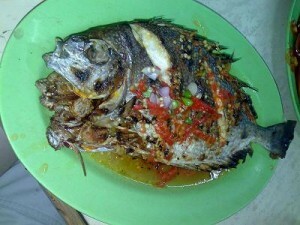 what a great idea to fried the mussell before cooking in those sambal sauces…. how come no one in SG ever thought of it? 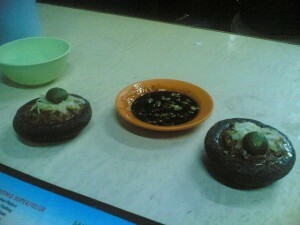 I dont really like mussell because of its chewy taste and some of them taste really bad. from the photos above, the Cumi and the mussells look delicious. The fish and crab look OK. i still think Singapore pepper crab is the best although it is defiinitely more expensive. so have you put on weight? eat and eat and eat and eat? need to run marathon after you your trip..
fast fast in… fast fast out…. hee..
hope u feeling ok now. Just a small one, recovered the next day though didn’t risk taking any funny food after that.